beMatrix® Custom Exhibit Rental Program Japan | Idea International, Inc. Idea International’s new beMatrix® custom exhibit rental program in Japan gives you the opportunity for a look that is flexible, graphics-friendly, sustainable, and easy to use. With our new Japan-based beMatrix inventory, we can deliver a high-end modular, extruded aluminum exhibit system when your trade show schedule brings you to Japan. BeMatrix® has become the industry’s leading exhibit rental solution, with exhibit and event companies adopting it worldwide as the backbone of their exhibit rental inventory. Why beMatrix? Because it combines modularity with custom-built exhibit features and because the same frame is suitable for hard panels, SEG fabric graphics, slatwall, Plexiglas®, and custom infills. Don’t settle for a shell scheme when you can have a custom exhibit rental. Building a market base in Japan takes time. Japanese customers build lasting relationships over a period of years, not months. Many exhibitors who are at a Japanese trade show for the first time take a smaller space either to test the waters or because by the time they made the decision to exhibit at a show, smaller spaces offer the only availability. But a small exhibit doesn’t need to be timid or dull. As with any trade show, anywhere in the world, show organizers offer booth packages. This is true in Japan. But exhibitors don’t have to opt for the booth packages on offer. Rather than opting for the show organizer’s shell scheme, exhibitors now have the opportunity to have a compelling exhibit no matter what the size. Shell schemes can be boring; Idea International allows exhibitors to stand out from the crowd—even first-show time exhibitors utilizing rental exhibits. In Japan, Idea International offers a number of options that will have a more significant impact on the show floor than the organizer’s booth package. Custom exhibit rentals are an increasingly popular and cost-effective option for corporate exhibitors at global trade shows and make sense financially. With the Idea International program, our custom exhibit rentals are also environmentally friendly. Our beMatrix components are infinitely reusable and give exhibitors a striking presence on the trade show floor. The frames in the beMatrix product line can be re-used in their original format for the ultimate sustainability solution. Add to that fact the durability of the frames, and you can understand the rationale behind Idea International’s custom rental exhibit investment in a beMatrix inventory. Every part is 100% recyclable. Moreover, the beMatrix system doesn’t use any acids that pollute the environment in the manufacture of the aluminum frames. Plus the use of substances like paint and glue is minimized as much as possible by using textiles or panes. Even more importantly, with the beMatrix system, Idea International will be able to replicate your global design. Based in Belgium, beMatrix is setting a worldwide standard. The beMatrix option is an excellent choice for global exhibitors coming to Japan who want to keep a fresh image on the trade show floor but who also need to ensure brand continuity and identity wherever they exhibit. The uniformity of the beMatrix frames means that dimensions and combinations fit exactly, in all directions, on design drawings and on the show floor. Graphics fit perfectly with almost no aluminum showing. Everything is possible—sharp or rounded corners, angled or sloping walls, indentations or t-joints, arches, and curves. The system also combines lighting, shelving, monitor mounts and other accessories with the frames so that you can translate your exhibit designs from drawings to an actual 3-D structure. Idea International can use your existing design or develop a custom exhibit rental option that meets your exhibiting needs and gets you the visibility you deserve. Idea International and beMatrix provide a solution that helps you meet universal trade show goals and objectives: to stand out on the trade show floor, to promote your brand, and to attract visitors, no matter where the show takes place. 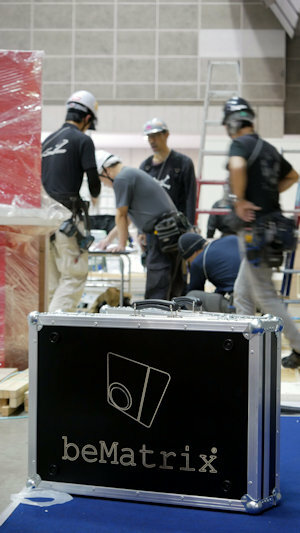 The beMatrix custom rental option may be for you when you exhibit in Japan. Let us help you make that choice. Idea International is proud to offer this option to exhibitors at Japanese trade shows. For additional information about our custom exhibit rental program, contact Idea International today.